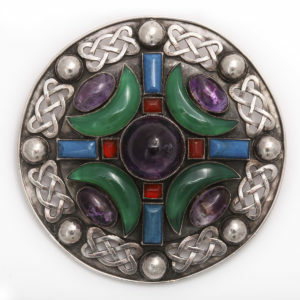 Pictured above is a Scottish kilt plaid brooch by Sybil Dunlop, a designer highly regarded for her Arts and Crafts jewelry of the 1920s and 1930s. 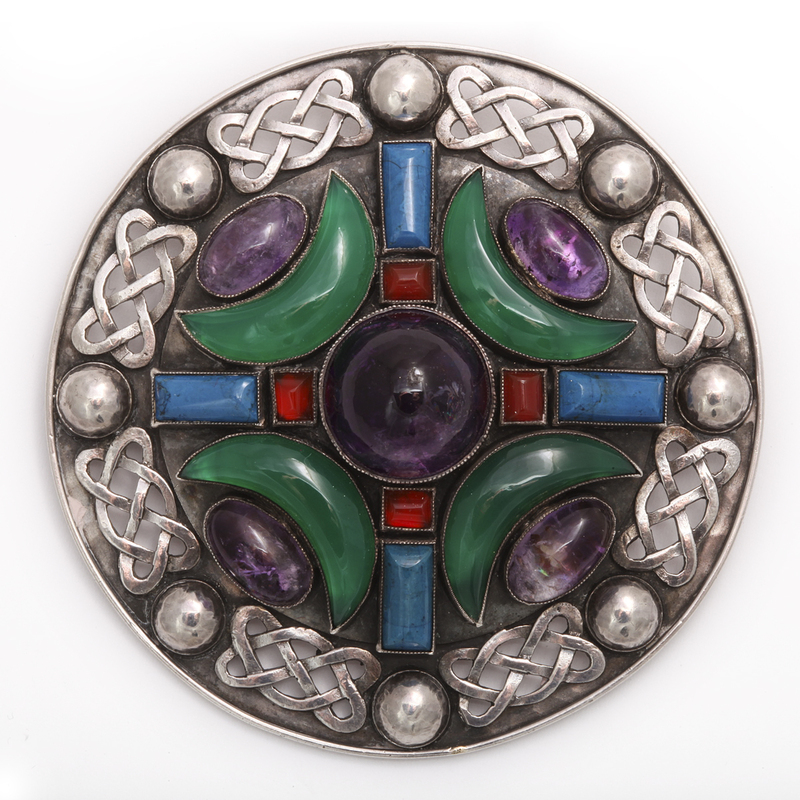 Made of silver, cabochon stones, and done in a Scottish design, this piece adheres to the Arts and Crafts principles that have their roots in the 1860s. In this post we will explore the background of the Arts and Crafts movement and how it applies to jewelry. The British Arts and Crafts movement flourished between 1860 and 1910. Inspired by the writings of John Ruskin (1819-1900) and spearheaded by William Morris (1834-1896), the movement was a reaction against mass-production and mechanization. Distraught over the impoverished state of the decorative arts as well as the conditions in which they were produced, those involved in the Arts and Crafts movement aimed to both reform design and reinstate the dignity and importance of the individual craftsman. While the Arts and Crafts style and philosophy were successfully adhered to a majority of the decorative arts, producing jewelry within the movement’s aims proved to be quite challenging. In accordance with the philosophy of the movement, a jewel was to be designed, created and decorated from start to finish by a single craftsman. The movement not only shunned the use of mechanization but also held disdain for the practice of specialization within any given field. While a successful piece of furniture could be achieved within these parameters, they proved to be quite detrimental when applied to the art of jewelry making. Historically fine jewels are often the result of many specialized craftsmen (lapidaries, enamellers, chasers, engravers, modelers etc.) and the collaboration of these specialties are most exemplified in the jewelry of the Renaissance era. The Arts and Crafts jewelers aimed to create handmade jewelry of artistic rather than intrinsic value. Silver was preferred over gold and while faceted stones were rarely used, diamonds never were. Cabochon or uncut stones enlivened the designs while recalling Medieval tastes. The natural qualities of the materials were celebrated and mother-of-pearl, turquoise matrix and unique baroque pearls were some of the jeweler’s favorites. The nineteenth century revival of Renaissance and Medieval enameling techniques were also hugely important to Arts and Crafts jewelry. Not only did the traditional non-precious material embody the sentiments of the movement, it also afforded the jeweler unlimited artistic possibilities. The Guild of Handicraft produced some of the finest examples of Arts and Crafts jewelry. Founded in 1888 by Charles Robert Ashbee (1863-1942) the Guild of Handicraft was both a workshop as well as a school. Initially the Guild concentrated on woodcarving and metalworking but in 1891 the first jewelry classes were offered. The early pieces produced by the Guild were predominantly silver, quite large in size and unashamed of their unrefined handmade appearance. By the turn of the century, many more conventionally trained craftsmen had joined the workshop and the Guild began to produce increasingly more elaborate jewelry. In keeping with the characteristics of other Arts and Crafts jewelers, defining features of the pieces produced by the Guild of Handicraft include hand-beaten metal surfaces, the use of traditional enamel and cabochon stones as well as the preference for decorative themes derived from a romanticized pre-industrial past. Next week we will explore Arts and Crafts jewelry further through another item in our collection: an Archibald Knox necklace.